Yvonne Higgins Shares Her Story, about being a cousin to Dale. This is my story of how I knew Dale as a child. It is also about how I liked being a background actor in the now made movie for ESPN "3" which is coming out in December if not before. Dale and I are cousins. Dale and I were born a year apart. My birthday is in February and his is April 29. My uncle (now deceased) was married to his aunt (his father's sister). As a child, I remember having to go to Kannapolis, NC every Sunday after church to visit my mother's family. She was from Kannapolis and her family still lived there while we lived in Charlotte, NC. On these Sunday's I remember going up to his house through my uncle's backyard, which is only, yards away. We would play outside and most of the time is was "hide and seek" or "catch me if you can". Sometimes we would sneak into the house to the room that "Daddy Ralph" had all of his trophies in and just stand there and stare at them, never touching them because we were afraid we might break one of them. Dale would stand there and say, "When I am older I am going to have trophies just like that". "I am going to have so many that they will fill up a whole house", little did he know how that statement would come to be true. Not only do his trophies fill up a house they fill up an entire complex called Dale Earnhardt Inc. in Mooresville, NC. As Dale grew older his two sister's Kay and Kathy would take us to Fries Skating Ring where we all four of us would roller skate. Let me tell you Dale was "Hell on those skates just as if he was in a racecar". It did not matter what kind of wheels were under him. He was going to race hard and try with all his might to win. When Dale grew older the skates where laid to rest and he was in his Dad's garage behind the house 24/7 working on racecars. That Dale would much rather work on a racecar then eat, sleep and do his school work. I know as a man Dale said many times in interviews he wished he had not dropped out of high school. That is why he has seen to it that his children all received the best education possible. He promoted education and would speak on staying in school and getting your education. He was also a firm believer in achieving a higher education when possible. 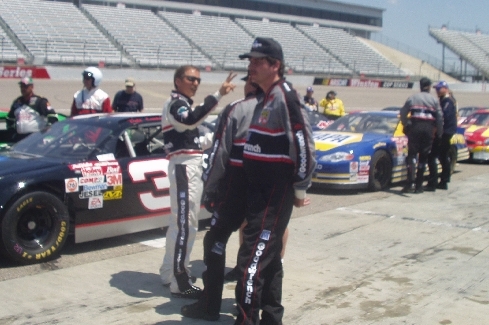 The more Dale got involved in racing the less I saw of him. He did not like for his sister's and I to bother him when he was working on his cars. I would go to the races at the dirt track with my parents and see him and Ralph race. Once Dale made "The Big Time", NASCAR, my parents carried me to every race that was in driving distance. However, this all changed when I became interested in boys and obtained my driver's license. While I was finishing high school, Dale was out there racing and already making a name for himself. He really did not have time to spare except for his immediate family. He continued to do his thing and I did mine, so we drifted apart, I am sorry to say. I kept in touch with our other cousins, aunts and uncles to stay up on what he was doing and how he was getting along. I am not angry or bitter because I was not part of his life all of his life. I cherish the time I spent with him as a child. After all, he was a male and I was just one of several female cousins. I am so proud of the man and father he became, all of his accomplishments, his generous heart which most of the public does not know about, his giving of himself to help preserve nature and his fellow man. The movie producer's and writers researched all the material and film they could get their hands on to make this movie show "THE MAN". I wanted to, in some way let him know that I still cared for him and one day we would be able to spend time together again and reminisce about our childhood and our adult lives. My first call was to the East Lincoln racetrack in Lincoln County, NC. It is a red dirt clay track similar to the one Dale used to race on. This lasted four days with hours being 12, 14, and 16. This made for very long days but in the end it was well worth it. The next four days were at Rockingham, NC (THE ROCK). 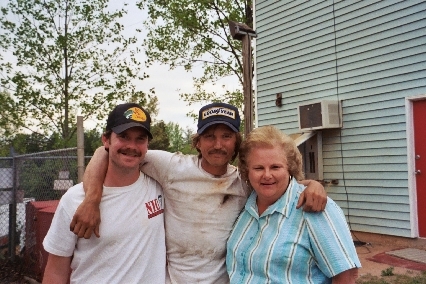 I had the great pleasure of having my picture taken with Mr. Barry Pepper and obtained his autograph at the dirt track. Those of you who follow Barry and his films already know what a tremendous actor he is. However, I need to tell you since he co-produced this movie he had his heart and soul into the production. He focused on making sure everything was top notch and by the letter. If you were an extra and approached him for a picture or an autograph, he would take the time to honor your request and talk to you awhile if he had the time. Barry is so thoughtful of those in his presence. He just shines with kindness, sweetness, and honor. He is very down to earth, not stuck-up as some Hollywood actors appear to be. In my opinion, he was the perfect one to star in this movie. I watched him very closely and I am proud of how he showed Dale become "THE MAN". Mr. Pepper as one long-distance cousin of the Earnhardt family I want to THANK YOU for the care and professionalism you gave in the making of this movie. I loved you in the Green Mile, "61" and Saving Private Ryan but I think this just might be your best work so far. Keep up the great work and I look forward to you producing and staring in many more movies. Having been a background actor in the movies "Stroker Ace", "The Color Purple" and "Eddie", I want to thank the writers, producers, production crew, and extras for your professionalism shown during the making of the movie. It rates right up there at the top. I want to thank the casting director for calling me and making me a part of the movie. It was truly an honor and a blast. I hope we get the opportunity to get together and do it all over again with Barry in another movie.